Natalie and I were wandering around the National Trust’s Tyntesfield estate the other day, when I got bored with the nicely manicured path we were on and decided to head off-piste into the undergrowth. At first a little dubious about my motives, as well as about my ability to find my way back again, a very cautious Natalie followed me. It turns out that the path is clearly in the wrong place, because no sooner had we left it behind us, than we stumbled across this most magnificent tree. 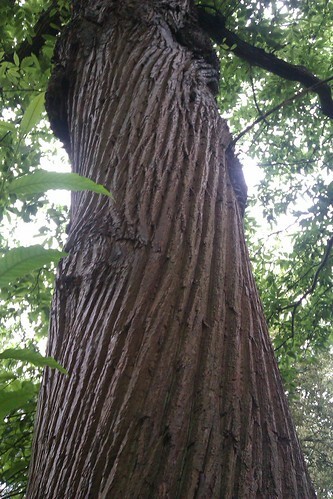 No idea what sort of tree it was, but it (a) was huge and (b) had the most amazing bark that I’ve seen for some time*. The tree looked like it had formed underground, somewhere deep in the bedrock, and then twisted itself forcefully out of the ground. Like something out of Lord of the Rings. And it was all I could do to resist giving it a hug. All well worth a short detour. * Still no match for my favourite Acer griseum (the paperbark maple), of course, but you can’t have everything. This entry was posted in Outdoors, Photography and tagged National Trust, Nature, Photography, Trees, Tyntesfield by Simon Perks. Bookmark the permalink.